What's happening everybody? I'm new to this forum and tube amps so here goes my newbie question. I recently bought a Rebel 30 and noticed a hissing sound coming from one of the tubes. I called Egnater and they said that I had one of the earlier releases that had problematic tubes. Well, in rapid fashion, they sent me a new set of el84's and 6v6's. The original set was JJ tubes. The new set are Ruby's. Do I have to bias these tubes or, are they plug and play? Please excuse my ignorance. I really love this amp and can't wait to hear it without the hiss. Oh and by the way, the guys at Egnater are real down to earth and friendly. It's nice to see that for a change! Pre-amp tubes don't have to be biased. As a general rule you should ALWAYS bias power tubes, as there can be variation even if it is the same tube. Better safe than sorry! Yea, go ahead and re-bias. You will not regret doing that and you will know that all is good and harmonious in the floating electron realm. Thanks for the replies! I was wondering if anybody could give me the low down on biasing the Rebel 30? Is it something I should have done for me or can I do it myself? All you need is a meter that measures down to millivolts. Remove the upper rear panel to expose the test points and pots. The center test point TP1 is common. Measure across TP1 &TP2 for the EL84 pair. Adjust the left-hand pot to 40mv. Measure across TP1 &TP3 for the 6V6 pair. Adjust the right-hand pot to 40mv. Can anyone give run down on what the function of each of the 12AX7 tubes are doing? I am assuming the one between the two power tubes is the phase inverter. There are 4 more shown in teh picture above labeled V1, V2, V3 & V4. What's what?? Any updates? How did the tube change out sound? Any difference? I just ordered a full set of new tubes from Dougstubes on Monday! They're mainly for back up (I got the same JJ power tubes), but Doug recommended a Tungsol in V1 and Pentas in the rest, so that's what I got! I guess I'll find out soon enough, but I was just curious to see what the dealio was. That said, I still love my R30!!! Thanks for everybody's help. I swapped out my tubes to the Ruby's and rebiased it as it was set a little cold. I was nervous about the re-biasing but it was a breeze! The amp sounds so much better all around. It no longer makes the annoying hissing sound. I just did this alst night so I need a little more time to get a full assesment of the tones. I will post back soon with a more in depth report! Bumping again on the preamp tubes. Any body have an answer as to which 12AX7 does what function? I love this amp. Just drove up to GC in Austin yesterday and picked up a head. Back up amp is my intention but if I can get the distortion channel dialed in a little more I will be using it onstage for a while just for grins. The clean tones were just unbeleivable. I want to see the look on peoples face when I turn on this little tiny bad boy a create a ruckus! Edit: Just got an e-mail from John. V1 input tube shared between CH1 & CH2. The clean tones were just unbeleivable. I could not agree more! I the gain channel, but I honestly play on the clean channel just as much if not more!!! This amp is everything I'd been looking for in the past 3 years. Congrats on the new head! Definitely give Egnater a call. They are very helpful and have great customer service. 1-323-277-4119. That said, I do NOT have that experience with my R30 combo. My volume stays consistent, just the tone changes. Maybe bad 6V6(s)??? On my Rebel 30 I notice a slight but not major drop off in volume also. It is definitly louder on the el84 side. I'd go in and check the bias first. It could do that if it were a little off. No real differences in mine. I re-biased it after sticking in some JJ 6V6. One side was hotter than the other. I don't think this is actually a problem. On the Renegade I noticed it was loudest at 12 o'clock- I think because all 4 tubes are operating. When you shift to one side or the other I think you go down to some mix of 2 or 3 tubes, hence the volume is less. Having said that, there is never any harm in re-biasing. It's a good idea to do it every now and again. Very true Len. I think what he is saying is the full on EL84 side is quieter than the full on 6V6 side. Which is also normal but it should not be very drastic at all. I think the 6V6's have more output anyway. Again, I am not sure there is anything wrong here, but he might as well re-bias anyway. Yep, agreed. Mine was a little off. I put in the JJ 6V6 and then turned it on. I liked the way the Ruby EL84 sounded and I didn't have any options laying around so I left them. When I turned it and checked teh bias the EL84 side was a little hot, somewhere around 50, then I adjusted the new set of 6V6. All good. I wanted to check the bias on my Rebel 30 Head. The photos showing the bias test points and trimpots on the combo are super helpful. To access these on the head, do I have to slide the amp chassis out? I'm guessing that it the four screws on the bottom that I need to remove to do that, right? Correct Alan. That's how you do it. Thanks for the advice guys. I was actually saying that the volume is quieter on the "full on" 6V6 side than it is on the "full on" EL84 side....and yes, it is loudest at 12:00. It's not a huge volume drop off, in fact it is slight....it's just kind of annoying. When you turn up the volume on the 6V6 side the amp sounds great so I don't think that it is a problem with the actual tubes. That is why I thought that maybe they were just not biased the same or something. This looks so simple, I'd like to try doing it myself for my R30 head. My question is: I'm freaked out about all the "high voltage" warnings as far as removing the chassis. Which components in the chassis do I need to avoid touching to be safe? Is there anything exposed in there that will shock/kill me if I touch it accidentally? This may seem like a dumb question to many of you, but I'm being serious. I'd really like to do this simple maintenance myself, but I want to be safe above all else. To be safe, all you need to do is unplug the amp from the wall and then let it sit about 30 minutes. That will make sure that all residual power is gone from it. You can touch anything at that point. Really dumb question but I'm asking anyway...when you're biasing a Rebel 20 or 30, you do it with the power on, speaker(s) plugged in, guitar plugged in right? Or can you bias it while on standby? Or while it's off for that matter? From what I've seen/read, the amp has to be on (not on standby), & must be plugged into a speaker. No instrument needs to be plugged in. Let the amp warm up for at least 5 minutes to get accurate readings. I've also read that channel volumes should be at zero, but not sure how important that is. For the benefit of those who are a little gunshy opening up they're Rebel 30, biasing my Rebel 20 was a cakewalk. I'm not a techy gearhead by any stretch (just don't go pokin' around ANYWHERE other than the testpoints and you won't end up with hair like Rod Stewart) Went to the shack and picked up a digital multimeter for 20 bucks. Owned my Rebel 20 for about a year. Haven't swapped any tubes, still has stock JJ's in the power and soveteks in pre. Interestingly, when I checked the bias, BOTH the 84's and the 6V6's were a tad on the cool side...about about 36mv on the 84's and about 40 on the 6V6's. Makes me wonder if power tubes have a bit of a break-in period. Made the adjustment in a matter of moments and a great amp sounds even a little better. Thanks for this thread and all the help. Egnater rules! Is there any significant danger of getting electrocuted if I try to set the bias when swapping out power tubes? Are there any extra precautions I should take? There is always significant danger when you put your hands in a live amp. My honest recommendation is that if you don't know exactly what you are doing, then have someone knowledgeable help you out. If the amp has to be ON while checking the bias, then what is the point of draining the amp of extra voltage? You drain the voltage to swap the tubes and not kill yourself at the same time. Obviously, the amp has to be on to bias the tubes once they are in. Len, forgive me for being a little slow but I think you're saying turn off the amp, drain the voltage, swap the tubes, then turn on the amp to check the bias. Correct? If so, then I guess I this means that if you turn on the amp and the bias is off, this won't damage the amp? I am not an electrician, but yes that is what I am saying. I don't think the bias is ever "off." Do the power drain and tube swapping first. Turn the amp back on. Re-bias according to the instructions in the manual. 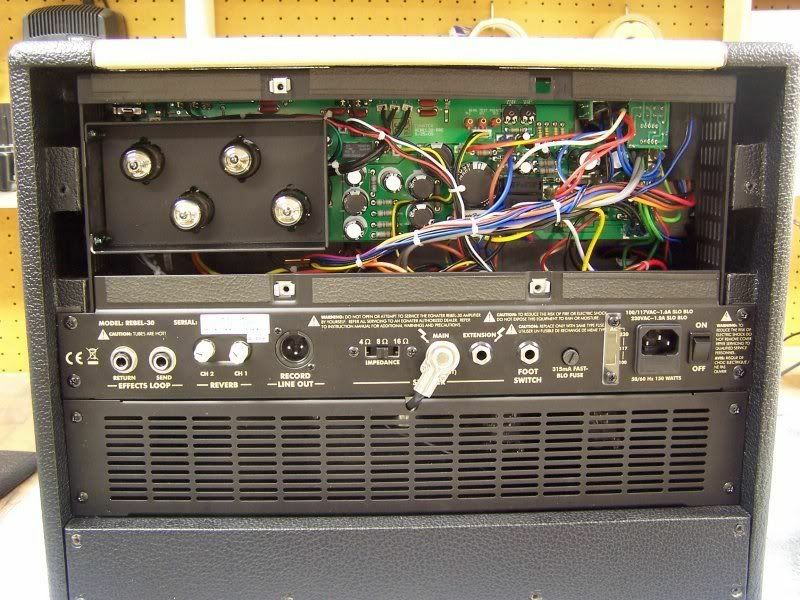 There is no reason why a properly done re-biasing should damage an amp. It is a good thing to do every now and again even if you don't swap the the tubes because the bias can drift over time. Hi guys...resurrecting an old thread. I'm a noob to biasing and just wanted some clarification. The question is how do you adjust? do you turn by hand or use a flathead screwdriver in the middle of the Pot? Flat head screwdriver. Check the manual because you often have to have the knobs set certain ways since they can influence the bias readings. Thanks Len...I appreciate the response! these biasing instructions are in the rebel 30 manual? Are the Egnater amps cathode or fix biased? All of the models, with the exception of the Tweaker, are fixed/adjustable bias with easy to use test points. 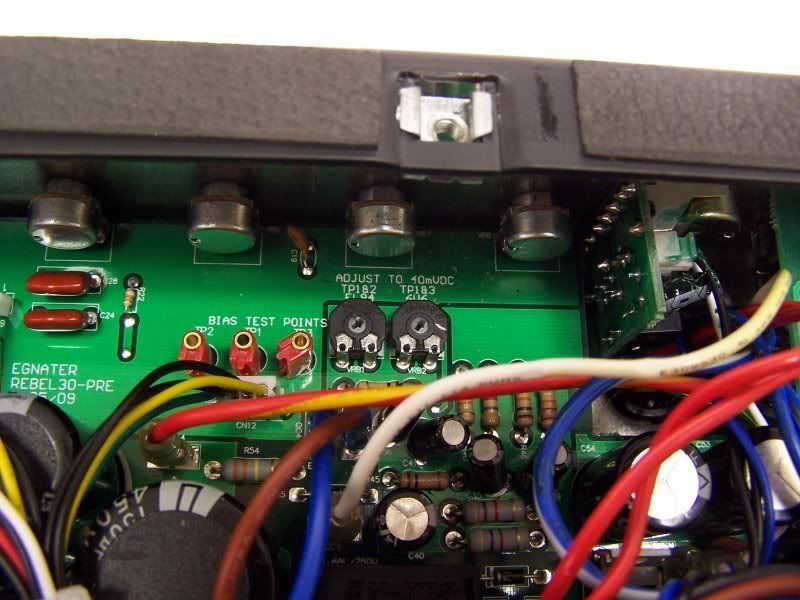 Consult the owner’s manuals or contact support@egnateramps.com for information on how to properly adjust the bias. The Tweaker is cathode biased so there is no adjustment required when replacing tubes. The Tweaker 15 is Cathode biased, the Tweaker 40 is a fixed bias. The Reb 30 bias instruction PDF was posted by Ian on another thread.